Pamper your skin with Genuine Virgin Aloe TriDerma Psoriasis Control Cream 2.2oz, model #62025. TriDerma is a line of true skin care products made with Certified Genuine Virgin Organic Aloe, moisturizers, and other carefully selected botanicals to target and help heal a wide variety of skin problems. The Genuine Virgin Aloe TriDerma Psoriasis Control Cream 2.2oz this is a concentrated non-greasy cream that provides fast acting relief for psoriasis on your face, scalp or body. It gently relieves skin of white, flakey dead skin cell build-up, extreme dryness, redness, scaling and itching. Daily use helps skin look and feel normal. Plus, it helps prevent flare0ups without the use of cortisone or other harmful drugs. 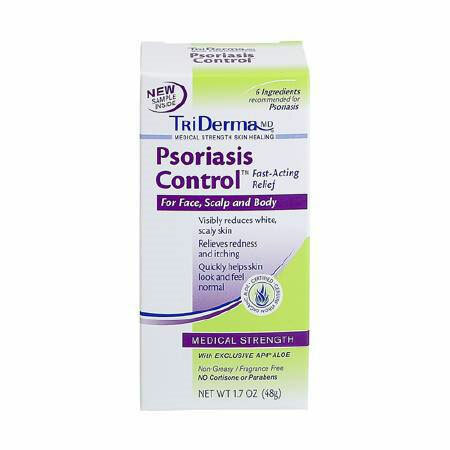 Psoriasis Control contains specific healing ingredients to eas the symptoms of Psoriasis. This chronic skin disorder cannot be cured but it can be managed, safely and effectively, without the use of steroid products, coal tar or other prescription drugs. Its unique combination of AP4 Genuine Virgin Organic Aloe Complex, Urea, Salicylic Acid, Zinc PCA, Vitamins A, B, D, E, Oat Protein and other advanced healing ingredients help promote repair, while making it gentle enough to use on any sensitive skin area, including on the scalp. Daily use helps prevent flare-ups and helps restore and maintain healthy skin. Salicylic Acid gently exfoliates to reveal softer, smoother skin. Urea, nature's true moisturizer, delivers intense moisture without being greasy. Soothing oat protein and other natural healing botanicals help relieve redness, scaling and itching. Can be used head to toe, including on your scalp. Aloe Barbadensis (AP4 Genuine Virgin Organic Aloe Vera) Leaf Extract, Allantoin, Avena Sativa (Oat Protein), Beeswax, Caprylic Capric Triglyceride, Cetearyl Alcohol, Cetyl Alcohol, Dimethicone, Disodium EDTA, IPBC, Panthenol (Pro Vitamin B5), Petrolatum, Phenoxyethanol Polyshorbate 60, Retinyl Palmitate (Vitamin A), Sodium Hyaluronate, Sodium PCA, Tocopherol Acetate (Vitamin E), Triethanolamine, Urea, Zinc PCA.